Craft shows changed my life. Last weekend I sold my yarn for the first time in over a year (I put my yarn business on hold when I could no longer get packages out on time, thanks to traveling to teach. This weekend I was back in the game with a few skeins of my yarn (and my mom's sheep's fiber). Preparing for the show and helping my pal Misty think through the process brought it all back in a rush. Even though I help Starshippers get prepared for their first shows (and 50th shows) every month, I had forgotten what it was like to be in it. To be worried you don't have enough. To do late night, last-minute labeling. To get nervous about people seeing your work. So, to calm my nerves, I searched my own site for advice (the major benefit of having a blog!). And sure enough I found it. In 2008 (that's 6 years ago! 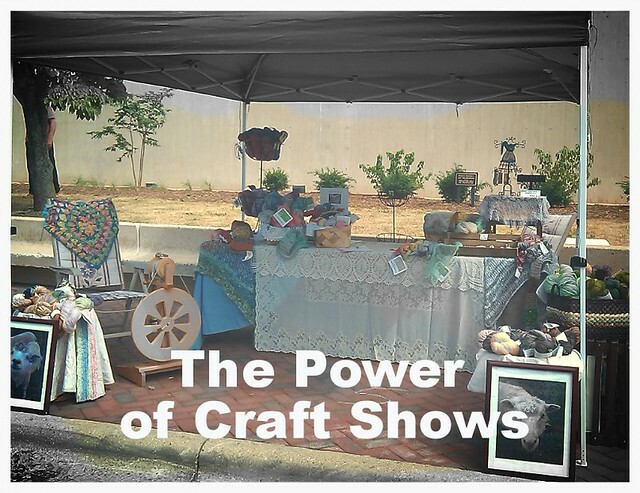 ), I wrote about my first craft show here, in 5 1/2 Shocking Facts about Craft Shows. It occurred to me, in reading through these posts that this where I really got clear on the power of following my enthusiasm. 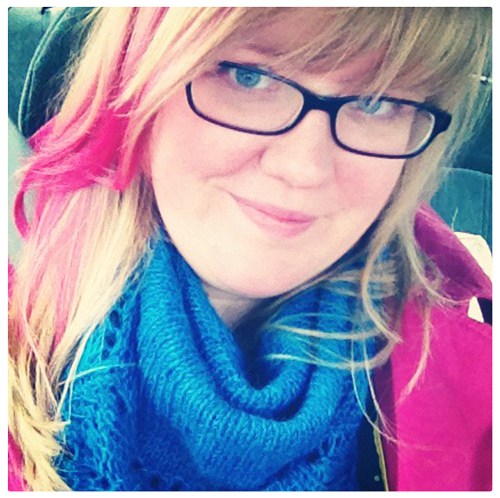 This is where I learned that it is OK to be weird, pink-haired, wonky me. Those first shows, while I still worked in a boring office in black slacks, were the first taste I had (maybe ever?) of being myself out loud and connecting with people as that true self. Once you get a taste of that, you can start to imagine the possibility of being yourself, expressing yourself, like … all the time. Once you get a taste of it, you can start to imagine the possibility of being yourself, expressing yourself…all of the time. For me this meant making more yarn, doing more shows, and connecting with people in the maker community. That led to me spending my days writing, talking, and helping other makers bring more of themselves into their businesses, to craft a life they really want. But for you, the path will be different. It will lead you in different directions. You can start to express yourself more in how you dress, how you tell the truth and how you embrace all your weird bits. I totally haven't figured it out yet, and I'm certainly not comfortable being myself all the time, but it's a process. You can kick-start the process by choosing to do things you're enthusiastic about, by doing more of what makes you feel like yourself, and by letting those experiences transform you. Whether it's craft shows, or making your art, or just starting to take your enthusiasm more seriously — it could change your life. PS. I made a class sharing everything I knew about craft shows 4 years ago. Currently it's only available in the Starship, but I hope to refresh it and offer it again in 2015. Sign up here to get notified when it's ready. In the second episode we talked about why you should explore your enthusiasm, what it can add to your business (and life!) and how it works to keep you motivated. But I feel like my commitment to enthusiasm (and that of my clients) has been tested this month and I wanted to share it with you, in case you're also questioning your enthusiasm. This week, I'm sharing some stories of creative business ladies following their enthusiasm, both myself and my clients, in the hopes that it helps you on your journey. What are you enthusiastic about right now? How could you act on it in a small, do-able way? 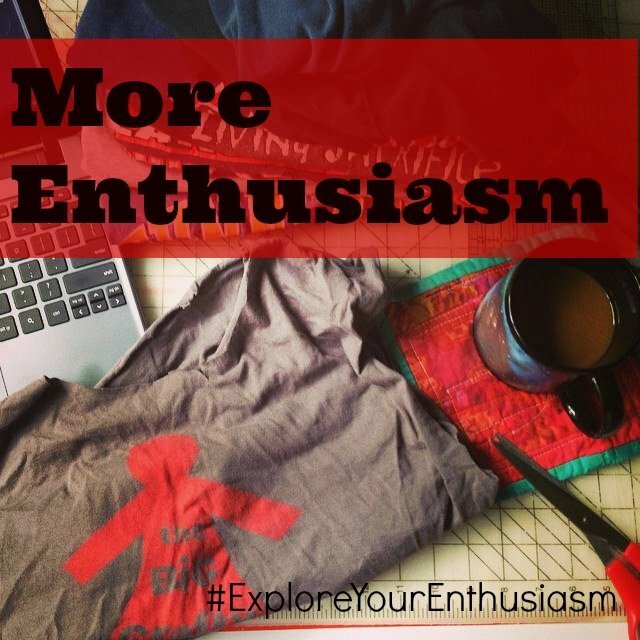 Welcome to the second episode of Explore Your Enthusiasm! 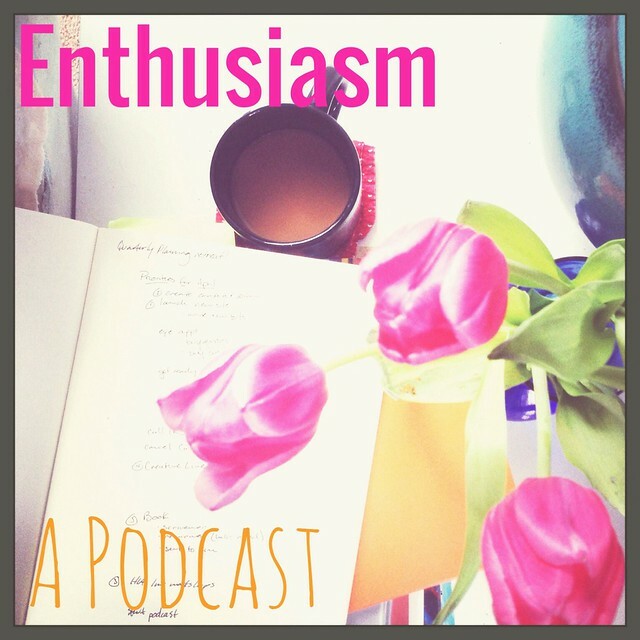 This week we're talking about ENTHUSIASM. It's right there in the name of the podcast + it's a vital tool in a sustainable business. We'll cover why it matters, what to do when you don't have any, how you can learn from your craft, and how to make even the most boring tasks more fun. I also share a bit about my own crafting funks, some burn-out horror stories and what I've learned when I follow the enthusiasm in my own business. You can subscribe to it on iTunes here or via Stitcher here (or subscribe in whatever you use for podcasts – just search “Explore Your Enthusiasm” and it should pop up!). Find all the other podcasts here. How do you follow your enthusiasm in your business? What have you learned? If you're feeling burned out or bored, how are you going to start experimenting with your enthusiasm? This post is part of The Declaration of You's Tour, which I was honored to be invited to. Learn more — and join in — by clicking here. Although I haven't read the book (yet), I'm a big fan of Jessica Swift's work…and I always like talking about enthusiasm, so I was thrilled to accept the invitation. 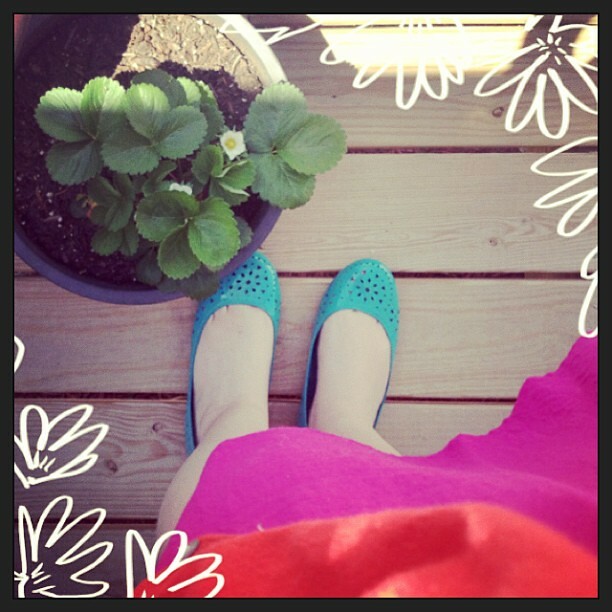 What if the “right” thing to do for your business is to find your own way? What if the path to success is in finding your own path? This would mean, your #1 business priority is….you. Your gifts Your passions. Your enthusiasm. Your sole responsibility: Show up, every day, to your enthusiasm. I write about this all the time, but it's so easy to forget, or doubt. We think we have to do more. You worry that you have to pushpushpush to get it going. Because it's true that business is hard work. But it's not hard someone-else-told-me-to work. The hard work can be based on what you want, and where you're going. When it is, the hard work streams directly from your enthusiasm. Your to-do list is full of things that you put there, because you want them done. We lose this, when we think we don't get to have what we want until we “make it.” We think we have to follow the rules, compare our work to others, strive strive strive before we get to have what we're after: freedom, love, comfort. But you don't have to wait. You can experience that before you've got your dream business. You can have it while you build your business. Following your enthusiasm, at every step. Don't let other people's awesomeness distract you. Don't let anyone tell you what has to go on your list, but you. Don't even let your own ideas for how it “has to be” derail you. Define (and regularly redefine) what it is you really want, what you're really after. (Is it really the money…or what you'll do with the money? The press…or what the press will mean to you?) Put the real things, the experiences and feelings you truly want, at the top of your priorities. Get up each day, and work on the things you're enthusiastic about. Check in regularly – is this what I want? Am I feeling what I want right now? Note if the things you're enthusiastic about every day line up with the steps on your map. If they never line up, reassess your priorities and the things you're mapping towards. Your enthusiasm is the best guide towards the business you'll actually enjoy being inside of.Trust it. Listen to it. What are you most enthuastic about today? Have a hard time talking about your most enthusiastic work? Join us for a 3 day word-finding adventure, that uses your favorite images to inspire your words.